We are always looking for Volunteers to help out on Concert nights and at other times. Volunteer jobs include ticket selling, front of house, setup for intermission, and other tasks. Whether you have a few hours a month or 100 hours a month (or anything in-between), we’re always looking for assistance. We are pleased to offer our Volunteers free admission to the Concert! If you’re looking for a rewarding opportunity and would like to volunteer with the SPO, please fill in the FORM on the right, or email us at spo@spo.ca. Thank you for supporting Great Music! Thank you to all of our Volunteers of the 2017-18 Season! We appreciate the efforts of our SPO Volunteers. Here’s a picture of some of our Volunteers from our last Concert of the 2017-18 Season, held May 5, 2018. (L-R) Heather Castrucci (Volunteers Co-Ordinator, SPO Board Member), Ivanna Angel, Tony Frey & Ally Ladak. 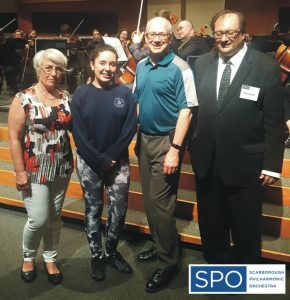 We would also like to acknowledge our SPO Volunteers not pictured; Brian Frey, Eric Frey, Inez Colwell, Sahana Selva and Dinah Panda, Karen Perras and Olya Chornyj.